Fact: Refugees are not a risk to Canadian security. Each refugee goes through several steps of screening, health checks, security clearances, and application paperwork. In Canada’s long history of welcoming refugees, no refugee has ever committed an act of terrorism. Refugees are fleeing violence, not causing it. Fact: This popular myth is false; refugees do not get more financial assistance from the federal government than Canadians pensioners do. Refugees may come to Canada in a variety of different ways, but if needed will only receive minimal financial support from the government to meet the most basic food and shelter needs. Fact: There is no evidence that suggests more immigration leads to increased crime. Immigrants commit fewer crimes than others, and are actually under-represented in prisons. Immigrants and refugees are like other people, a few may engage in criminal activities but the majority are law – abiding. Fact: Immigration does not cause violence; it actually discourages violence by promoting an open, diverse active and tolerant society. Newcomers who arrive to Canada are often looking to escape situations of violence and instead find freedom, peace and hope. Canada has actually experienced less terrorism than certain European countries that have not been as welcoming to newcomers. Fact: Immigrants do not take jobs away from Canadian-born workers, but actually help to increase job opportunities for all by stimulating the economy. Immigrants are eager to contribute to growing and building Canada into a prosperous country for all. What is the definition of a refugee and who can say they are a refugee? Is someone a refugee if they don’t come from a refugee camp? How many refugees are in Canada? How does Canada gather security information from refugees? Does Canada accept more refugees than other countries? What is the Immigration and Refugee Protection Act? Do refugees get more money for food than Canadians on welfare? What kind of health care do refugees get? How much has Canada spent on refugees to date? Are refugees an economic burden to Canada? How do Refugees Come to Canada? The Government of Canada works with the United Nations Refugee Agency (UNHCR) to identify registered refugees and verify identities. Applications of interested refugees are processed in visa offices and approved based on eligibility criteria. Refugees are transported on privately chartered aircraft (with military assistance when needed). Once in Canada, refugees are welcomed by Canadian Border Services Agency (CBSA) Officers who process their admission which includes a final verification of identity, and screening and treatment of illness. Most refugees travel to Calgary, Edmonton, Red Deer, Medicine Hat, Brooks, or Lethbridge where they will begin their new life. They will be greeted at the airport and taken to temporary accommodation where they will receive support to undertake the journey of settling and integrating in Canadian society. Refugees may initially settle in other Alberta towns if they are being privately sponsored there. What is the Refugee Resettlement Process Like? 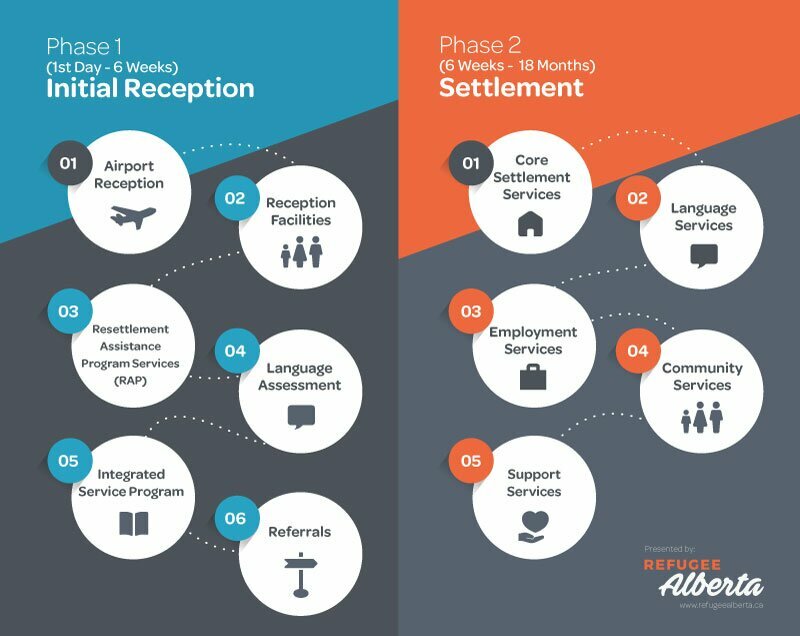 This infographic outlines the process that a refugee must go through to access supports, programs, and services once they have arrived in Alberta.